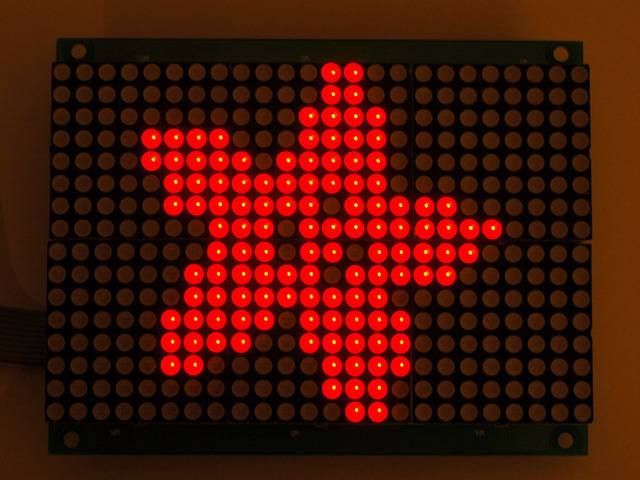 These LED panels take care of all the work of making a big matrix display. Each panel has six 8x8 red matrix modules, for a 16x24 matrix. The panel has a HT1632C chip on the back with does all the multiplexing work for you and has a 3-pin SPI-like serial interface to talk to it and set LEDs on or off. There's a few extras as well, such as being able to change the brightness of the entire display, or blink the entire display at 1 Hz. One really nice thing about this particular LED matrix module is that it is designed to be 'chainable' - you can connect to 8 panels together to make an extra long display. And of course, we have written a full Arduino library that not only takes care of controlling the display, it also intelligently handles chained displays, so that they appear to be one long matrix. The library has functions for drawing pixels, lines, rectangles, circles and text. You'll be making it display stuff in 15 minutes! This guide was first published on Jul 31, 2013. It was last updated on Jul 31, 2013. This page (Introduction) was last updated on Apr 21, 2019.